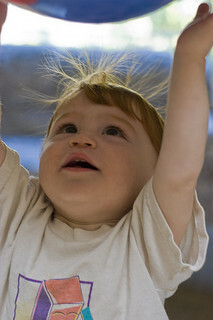 Static electricity is a charge that builds up when two things are rubbed together. Matching charges of static electricity push each other away (repel) while opposite charges attract each other. Everything is made up of atoms. An atom is the smallest piece you can break an object down to while still maintaining it’s properties. 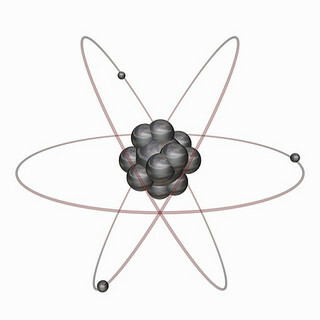 Atoms are made up of protons, neutrons and electrons. Protons have a positive (+) charge, neutrons have no charge (neutral) and electrons have a negative (–) charge. At the centre of each atom is a nucleus, this is where the protons and neutrons are found. The electrons are found to the edge of the atom, they are constantly moving in a circular motion around the nucleus. When two objects are rubbed together electrons pass from one to the other, making one more positively charged and the other more negatively charged. This charge is called static electricity. 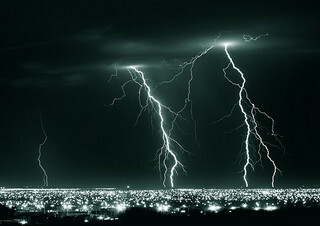 Lightning is caused by a build up of static electricity in clouds. As the charge in the cloud grows, the base of the cloud builds up a strong negative charge. This negative charge creates a build up of positive charge in the ground. If the attraction between the cloud and the ground (or between two clouds) becomes strong enough, a spark of lightning will jump between the two. This lightning is a giant spark of moving electrons travelling between the cloud and the ground. Did you know… that the heat of a lightning bolt is hotter than the surface of the sun? Some things give up or take on electrons more easily than others. Objects can be ranked according to how easily they give up or take on electrons and this ranking is called the triboelectric series. Things listed at the top of the triboelectric series give up electrons more easily than those ranked below. You will need… a balloon and a good head of hair! What to do… blow up the balloon and tie it tight. Rub the balloon all around your hair (this is called charging the balloon); Now move the balloon slowly away from your head and watch your hair stand on end! 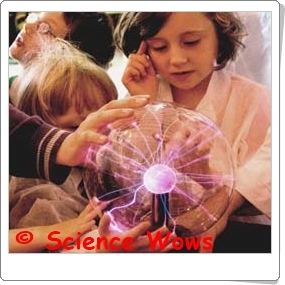 So what is happening?… When the balloon is rubbed on your hair electrons are passed from your hair to the balloon. This gives the balloon a negative charge and your hair a positive charge. As opposites attract, your hair is attracted to the balloon and sticks to it while you pull it away. You will need… a balloon, a good head of hair and an empty aluminium can! What to do… charge the balloon on your hair as before. Lay the empty aluminium can on it’s side on a table. Then bring the charged balloon close to the can, but do not let it touch it. Slowly draw the balloon away from the can and watch the can follow. So what is happening?… The aluminium can becomes attracted to the negatively charged balloon as the area around it becomes positively charged. You will need… a balloon, a good head of hair and a running tap! What to do… Turn on a tap to a small, steady stream of water and leave it running. Charge the balloon on your hair as before. Bring the charged balloon slowly towards the stream of water and you should see the stream of water slowly bend towards the balloon! (If the experiment does not work for you just reduce the flow of water). So what is happening?… Just as with the aluminium can, the stream of water becomes attracted to the negatively charged balloon as the area around it becomes positively charged. I hope you have some hair raising fun with these experiments :0) If you have any questions or queries, or would like me to cover a particular subject in the Fun Friday blog, please just leave me a comment below! I am going to take a little blogging break for a couple of weeks but will return in August for plenty more fun, facts and experiments to share.